You'll practice breathing techniques, stilling your body, and quieting your mind and in this short meditation. Nice voice, I like the short meditation, able to do them on break at work. 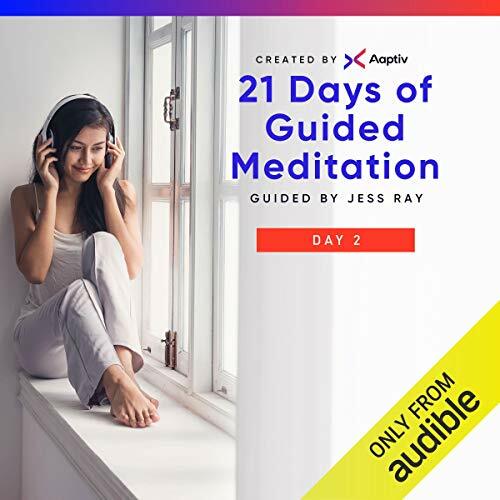 I have completed the first two days of this 21 day program and I have enjoyed it so far. For someone who has never tried meditation, it might be just the right place to start to benefit from the exercises. They only take ten minutes per day and I plan on completing the whole program. Too fast paced and "nagging". Tried to follow an instruction, but was interrupted by the next. Tells you to recite a mantra on your calm in-breaths, then the guide repeats it much faster than you can breathe calmly. Either had to concentrate on following the guide's changing, seemingly hurried pace, or try to ignore it and thus be interrupted by it. Day 1 was good, hopefully the next ones will be better than Day 2, or I definately won't finish this. At about the mid point I had to stop and really think about the instructions because I wasn't sure about what to do with the instructions to "become a witness". It deterred from the experience; however, because one is somewhat relaxed, it was easy to not do anything but listen and by the end I understood what the narrator intended. It was not a cohesive experience with regard to meditating and learning to meditate.